The moment Norman Osborn took control over S.H.I.E.L.D. and the Avengers, Frank Castle knew something had to be done immediately. From a safe distance miles away from Osborn, The Punisher used a high-powered Skrull sniper rifle and aimed a kill-shot straight at the media's new darling. Osborn was saved however, because his new bodyguard, The Sentry, plucked the bullet from the sky, milimeters from Osborn's face. The Sentry then pursued Castle and nearly killed him, but The Punisher was saved by a stranger named Henry, who used high-tech gadgetry to rescue the vigilante. The botched assassination attempt fueled Osborn's media machine, and he was soon interviewed by the local news where he explained the reason why The Punisher chose to target him. Osborn stated that 'crime has been nearly extinguished in NYC and that pyschopathic terrorists like The Punisher have nothing left to justify their killing sprees, so now Osborn has become their target'. Obviously a shot drawing sympathy from the public, but secretly Osborn wanted The Punisher dead. He enlisted the aid of The Hood to finish off Castle. The Punisher had some help though, his new partner was able to dig up dirt on Osborn, more specifically on subsidiaries of Oscorp in which there was a direct link to illegal operations like drug running, prostitution, third world slavery, black ops dealings (sounds like a wholesome company!). Over time, The Punisher was able to expose some of these illegitimate business practices that Osborn was involved in. This became a PR nightmare for Norman, as the media began suggesting that the crime rate numbers Norman was flaunting were bogus. The Hood, however, was unsuccessful at killing The Punisher, despite resurrecting long-dead villains to help in the task. The conflict with The Hood weakened Castle's efforts, leaving the door open for Osborn to strike yet again. This time however, Osborn used Daken (aka Dark Wolverine) to finish off Castle. Daken was successful, slicing The Punisher up into pieces and leaving him for dead. It appeared as though Norman was successful in his objective to eradicate the Punisher. Norman wanted the Punisher dead and that's what he got. Of course, no one in comics stays dead (Norman should know that! ), so when Frank Castle was soon resurrected as Frankencastle (not joking), but the less said about Frankencastle the better. Score this one as a win for Osborn. There was a time when The Punisher actually worked for Osborn, he was experiencing temporary amnesia when he did, but that still counts! Here's Norman hiring Frank Castle back in Peter Parker Spider-Man #89...how times have changed! 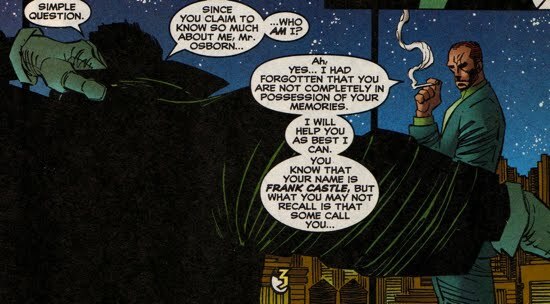 During The Punisher's war against Osborn, he raided numerous weapons caches that most likely belonged to Norman. 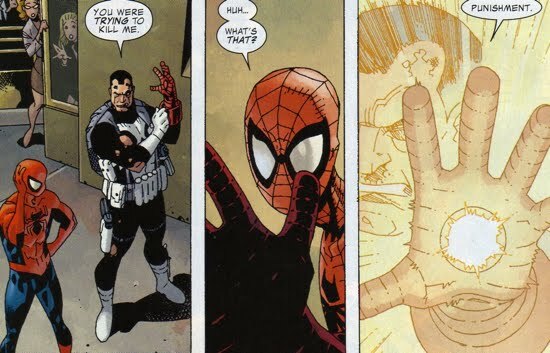 Imagine Spider-Man's surprise when he confronted The Punisher and was met with pumpkin bombs and blast from the Iron Patriot's glove! Interestingly, Frank Castle did not stop there. Later during the Goblin Nation story arc, The Punisher unveiled his version of the Goblin Glider. Isn't imitation the sincerest form of flattery?? One last nugget from Dark Reign, we can add another nickname on to Norman Osborn's list...Punisher refers to Norman as 'Red'...I like that one.